How to cut a pineapple? Ways of Cutting a Pineapple - If possible, you will need to avoid consuming canned pineapples because they are not as nutritious as the fresh pineapples. Of course having to prepare a fresh pineapple will provide you with more tasks. You will need to be able to choose the perfect ones from the shop, the ripe ones that can give you a rich flavor. The tips of choosing a ripe pineapple are to touch it first. You will need to ensure that it is firm. When it is too soft, then it means that the pineapple is overripe. As for the skin, you need to choose the one that is not too green, but the one that has more golden brown skin. The one that is too green means not ripe yet. The taste of the immature fruit is too sour and hard. Another tip in choosing is to use your sense of smell. Once you choose the right pineapples, you can use this tips to help you avoid the daunting task of the peeling. 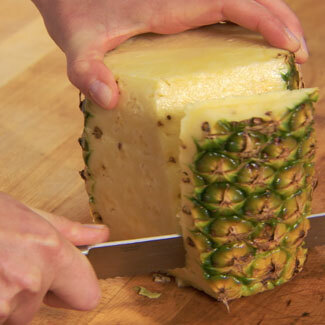 The right method will greatly reduce the time needed to peel of a pineapple’s hard and bumpy skin. As for the core, whether or not you want to throw it away, it is up to you. One thing for sure, although the core may be hard and not tasty, but it has the same amount of nutrient as the flesh. So throwing away the core means that you are throwing away a big part of nutritious pineapple. After the shopping, you need to prepare a long knife. A bread knife will serve you well because it is not only long but also have more flexibility to allow you to follow the contour of the fruit easily. Then let us start by cutting of the leafy top part of the pineapple and another half an inch at the bottom part. You can also twist the leaves if you want to replant the pineapple. But if you prefer to use the top part as decoration, then cutting is the best thing to do. Turn the fruit on its base then place the knife at the area behind the eyes. These brown spots of the pineapple has unpleasant taste, therefore, they must be removed. As the fruit near the eyes are very sweet, you need to cut closer to the eyes as possible. Cut the skin from top to bottom until everything is removed. Afterwards, it is up to you on how you want to cut the fruits. Should I Get a Pineapple Peeler?